to support hands-on inquiry by students in computer classrooms. as a basis for homework assignments. for dynamic presentations during class lectures. for inquiry during class presentations. to create imagery and maps for PowerPoint, Word, and other presentation tools. as a data discovery, organization, and distribution tool for research projects. to enrich discussion of an issue that arises spontaneously during an informal classroom discussion. Google Earth offers the means to display geographic data from a wide variety of sources together in a geospatial context. This data includes imagery for the entire globe at varying resolutions that contains a great deal of interpretable visual information. Students can use it to find their homes, schools, and other locations that are familiar to them. They can make inferences by comparing familiar places to other locations. In addition, students can learn about the world through rich layers of mappable data offered by Google's server and a great deal of third-party content. They can also create and display their own data. To obtain the free version of Google Earth see Google Earth: Explore, Search, and Discover. Many examples of how educators are using Google Earth are documented on the web. Following are some of those examples, and some articles. Peter Selkin has written an excellent article on Google Earth and Geoscience Education. Declan DePaor at Old Dominion University is having students create a collection of Google Earth teaching materials entitled Google Earth Science. This set of materials includes KMZ files that represented various types of tectonic plate boundaries, mountain belts, volcanoes, and other geological features as cross sections, and includes a profile of the atmosphere and Earth's magnetic field. Cutaways also represent the three-dimensional structure of the Sun, Mercury, Venus, Mars, the Earth, and our moon. For the Google Earth plugin running in a browser, Declan De Paor, Steve Wild, Mladen Dordevic, Steve Whitmeyer, Nick Pence, and Liz Weisbrot, developed a set of Google Earth Geoscience Labs and Exercises. 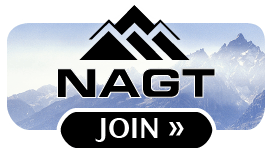 These focus on geologic landforms, the geology of Virginia, glacial geology, mid-Atlantic tectonics in Iceland, tectonics of Tonga, and other topics. Students in Dr. Christine Erlien's writing course, The View from Above: Google Earth's Impact, at Duke University, created a blog in order to share their knowledge of how Google Earth can, and is, impacting education. Their work can be found at Teaching (and Learning) with Google Earth. The University of Alaska Fairbanks offers a course Geog493: Exploring the Virtual Earth that teaches students how to use Google Earth, and offers introductory KML exercises. At Middlebury College in Vermont, the Food Mapping project is helping students understand how their meals relate to the Earth system. They can trace the ingredients for several types of meals back to their sources. In his post to the Google Earth Community Forums, Antarctica with ANDRILL, Ken Mankoff is making data from Antarctica available for educational use in Google Earth. Russell Tarr has created a Google Earth tour of Francis Drake's Circumnavigation. At the Yale University Peabody Museum of Natural History, Google Earth was used as part of a human origins exhibit. See Google Earth Community: Google Earth for interactive museum exhibits. Warren Apel initiated a thread, Google Earth Community: Some uses for Google Earth in elementary school. Bob Yewchuk presents many ideas for educational use of Google Earth in the thread Google Earth Community: Making Google Earth an educational "killer app" . Investigating wind energy with Google Earth engages students in assessing the suitability of a site for a wind farm after considering arguments for and against using the site for that purpose. A group of educators in New York State have developed New York Landscape Regions in Google Earth. This consists of a collection of datasets containing placemarks and overlays of USGS topographic maps for sites throughout the state, organized by physiographic region. The collection is primarily designed for high school Earth science classes, but can also be useful for introductory college geoscience courses. The project can serve as a model for datasets for other states. Each December, the American Geophysical Union holds its annual meeting in San Francisco. Sessions and/or presentations on geobrowsers have been offered in 2006, 2007, 2008, 2009, 2010, 2011, 2012, 2013, 2014, 2015, 2016, and 2017. Future sessions and presentations that include the use of geobrowsers are also anticipated. Also see T25. Google Earth Science: Geological Applications of Interactive Web-Based Maps. Juicy Geography has a lesson on Modeling sea level change on the Gold Coast of Australia. Real World Math has lesson plans for pre-college classes that use Google Earth to teach mathematics. Google Earth can support field studies by importing GPS data that has been saved in GPX format. GPS Tracks are represented as paths in Google Earth, and waypoints become placemarks. Google Earth data is in the form of KML (Keyhole Markup Language), which is an XML-based text format that can be edited directly in a text editor. Data created in Google Earth can be saved in KML format or in a zipped format known as KMZ. Because KML is a text format, spreadsheets can be used to create KML from data in tabular format provided that it contains latitude and longitude information in a systematic manner. Learning to edit or create KML directly outside Google Earth allows more flexibility than being restricted to the Google Earth user interface to create the data. To learn more about KML, see KML Documentation Introduction. When exploring places in Google Earth, students should make it a standard practice to look for points in the layers that in that location. They should learn to look for relationships between information from varied subject areas in order to develop an interdisciplinary thinking perspective. Prior to conducting a school field trip for any purpose, educators should add value to the experience by enriching the students' geographic perspective of the landscape they are about to traverse. The students should be given an opportunity to explore the route on Google Earth in order to develop a conceptual geographic context for the landscape that they are about to travel. They should be encouraged to investigate layers that contain information about places along the route. Google Sketchup is a companion program to Google Earth, also available for free download, for creating, modifying and sharing 3D models of buildings, bridges, and other structures. The models can be added as data for display in a geographic context in Google Earth's 3D Viewer. See the Google Earth User Guide for information about the techniques of using Google Earth. Formative assessment is an essential part of the educational process. In the computer laboratory, the instructor can observe the students directly as they engage in activities. Discussions during and after the activities provide constant feedback to the instructor, and student responses can reveal whether the students are learning what is intended. During the activities, the discussion can be modified toward mitigating any problems in understanding that are discovered during the discussion. If any of the difficulties in achieving the learning goals are caused by shortcomings of the instructional materials, they can should be modified to address these problems for the benefit of future classes. Instructors who use these activities in their classes should be provided with a means of communicating with each other, so that they can use each other's experiences with their classes to upgrade the teaching materials. This information should also be communicated to the groups who host the materials on the web or otherwise disseminate it. Students should be expected to hand in the results of their work either electronically or in hard copy form. If the activity involved creating any KMZ files, they should be submitted electronically so they can be viewed in Google Earth. This can also enable the instructor to determine whether the learning goals have been met. 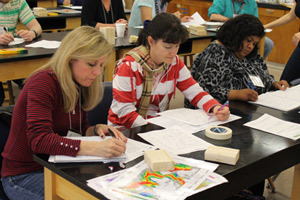 SERC provides an Assessment page to help educators and evaluation professionals make better use of evaluation in Earth system science education. For K-12 educators, the National Science Teachers Association has posted a review of the book Science Formative Assessment by Page Keeley, published by Corwin Press, Thousand Oaks, California in 2008. In addition to its value for classroom education, Google Earth is an effective tool for making data available for research purposes. For example, the United States Geological Survey distributes stream gage data in KML format on the Google Earth Streamflow KML Files page of its WaterWatch site. The Great Basin Center for Geothermal Energy makes a favorability map and temperature gradient data available for viewing in Google Earth at the bottom of its GIS Regional Spatial Data Download page. Four sessions at the 2008 Annual Meeting of the American Geophysical Union are focused on Visualizing Scientific Data Using KML and Virtual Globes. The 2010 and 2011 meetings of the American Geophysical Union included a session on Sensor Networks, as well as a specialized sesson on Sensor Networks in Hydroinformatics. 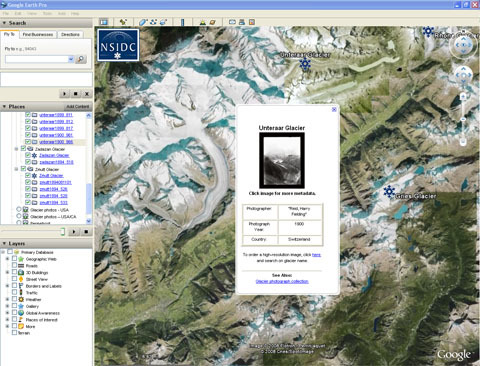 The National Snow and Ice Data Center distributes Google Earth files of snow and ice extents, mostly in form of overlays, on its View NSIDC Data on Virtual Globes: Google Earth page. The Arctic Region Supercomputing Center provides data on volcanoes on its Volcano Monitoring Using Google Earth site. View NSIDC Data on Virtual Globes: Google Earth - This site offers overlays and other map data indicating daily and longer-term changes in ice extent in polar regions. United States Geological Survey Earthquake Hazards Program: Google Earth Files - The USGS offers earthquake data, fault maps, shake maps, a virtual tour of the 1906 San Francisco Earthquake, and other geological data. 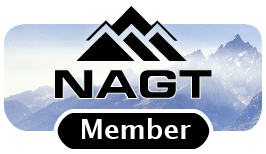 National Geophysical Data Center - This site offers data and imagery, including a natural hazards KML file with data on earthquakes, volcanoes, and tsunami events. Google maintains a KML Gallery with a wide variety of data on world oil consumption, a geologic atlas of the United States, rising sea level, population density, travel information, economics and other topics. Many of the posts in the Google Earth Community Forums have attached KMZ or KML data files. For an example, see the thread Arctic Sea Ice at another record low. Many posts to threads provide links to external sites that also offer data in KMZ format. The Google Earth Outreach Showcase features examples of data pertaining to current affairs, education and culture, environment and science, global development, public health, and social services. The National Oceanic and Atmospheric Administration offers Bathymetric Data including KMZ files. Google Earth Hacks contains a collection of data submitted or located by users. Steve Kluge's Google Earth Tools, Tours, and Placemarks, Earthcaching Links is nice collection of data and other information for educators. GPS Visualizer offers online tools for preparing GPS data for use in Google Maps and Google Earth. The tools can create maps with a choice of a variety of backgrounds, including Landsat imagery, topography, and political boundaries. USGS WaterWatch offers Google Earth Streamflow KML Files. Google Sightseeing has data classified by topic for use in Google Earth and Google Maps. The U.S. Fish and Wildlife Service offers wetlands data for Google Earth. Google Ocean has marine data for Google Earth. Ogle Earth is a blog with links to data and information about Google Earth and other virtual globes. The Google Earth Blog often features links to sites where Google Earth data can be found, and has articles on many Google Earth topics. Google Earth is periodically updated to incorporate new functionality, and people are continually developing new data and finding new uses for Google Earth. The following sites are good sources of information about these developments, and it is a good idea to visit them regularly. The Google Earth Community Forums are online discussions about Google Earth and many Earth-related topics. They are intended for sharing information about places, events, and techniques, and for exchanging data. You can join the Google Earth Community by registering and specifying a login name, password, and other information in an online form. Thereafter, you can initiate discussion threads or reply to posts in existing threads. Before submitting your first post, become familiar with existing ones, including the announcements and "sticky threads" marked by a push pin at the top of the index for each forum. Avoid submitting posts that essentially provide information that has already been posted. Posts to the Google Earth Community Forums can have a KMZ, KML or zip file attached. The KMZ and KML files are intended to be opened in Google Earth or Google Maps, and the zip files can be offered as archives that contain other file types, such as Word, PowerPoint and image files. In order to include images in the body of a post to the Forums, you must upload the images to a server such as Flickr or ImageShack and reference them from there. In most cases, image hosting services request or require that images embedded in forum posts or in pages on other servers function as links back to the host. In the case of Flickr, embedded photographs need to specifically link to their photo pages. The Google Google Maps blog offers news and other information about Google Maps and other geographic topics. Google Earth Hacks offers forums, news, data, and other services for Google Earth users. The Google Earth Blog by Frank Taylor offers Google Earth news, commentary, and tips. The news often consists of notifications of imagery updates, for example. Frank is currently sailing around the world and using Google Earth to guide and document his trip. Stefan Geens offers the Ogle Earth blog, which provides news about virtual globes, with a primary focus on Google Earth. Bjørn Sandvik's Master Maps Blog offers news, data, and tools concerning Google Earth and the Google Earth API. The site also discusses and provides examples of animations and techniques for representing data in Google Earth that are generally associated with GIS. 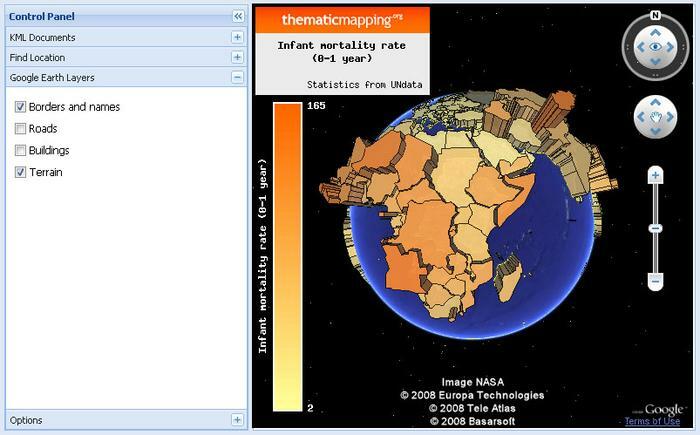 This infant mortality map includes a control panel and was developed using the Google Earth API. The map is available on the Thematic Mapping Blog. Google Earth Lessons provides educators with information, ideas, and data to enhance classroom instruction with Google Earth. Google Earth Design is a blog that offers advice on how to use Google Earth, tips on map design, and commentary on the design of Google Earth KMZ data that is available on the web. An effective means of keeping up with Google Earth developments is to attend or consult the literature or web content for meetings. Regularly occurring events that focus on geobrowsers are offered at meetings of the Geological Society of America and the American Geophysical Union. Google allows non-commercial personal use of the images created from Google Earth, provided that copyrights and attributions are preserved. Works created by an agency of the United States government are public domain at the moment of creation. This means that those images can be freely modified, redistributed and used for commercial purposes.